…Dacher Keltner, a professor of psychology at Berkeley, and Michael W. Kraus, an assistant professor of psychology at the University of Illinois, Urbana-Champaign, have done much of the research on social power and the attention deficit. Mr. Keltner suggests that, in general, we focus the most on those we value most. While the wealthy can hire help, those with few material assets are more likely to value their social assets: like the neighbor who will keep an eye on your child from the time she gets home from school until the time you get home from work. The financial difference ends up creating a behavioral difference. Poor people are better attuned to interpersonal relations — with those of the same strata, and the more powerful — than the rich are, because they have to be. in general, those with the most power in society seem to pay particularly little attention to those with the least power. To be sure, high-status people do attend to those of equal rank — but not as well as those low of status do. WEALTH & Research shows as it increases… compassion and empathy go down. Answer by Betty-Ann Heggie, Speaker, author, mentor on moving past gender stereotypes, on Quora, 1/25/18. Research shows that as people’s wealth increases, their compassion and empathy go down. Poor people are more likely to be generous with money and to stop for pedestrians in the street. They may depend more on interpersonal relationships, and therefore be more attuned to them. POWER & It decreases compassion and empathy according to research. …As people work their way up to the highest ranks, they lose touch with the daily challenges and aspirations of people at lowest ranks. They start to see people in large groups, rather than as individuals. And they treat people as problems to solve, rather than fellow human beings to relate to. This helps explain why research finds power reduces concern for others. … But right now, things are moving in the wrong direction. The higher up the ranks you go inside a company, the lower the EQ scores (measures of emotional intelligence) drop. A study of 1 million people by TalentSmart found that CEOs, on average, have the lowest EQ scores in the workplace. …A helpful definition comes from Psychology Today: “the ability to identify and manage your own emotions and the emotions of others.” It’s a combination of emotional awareness, the ability to harness and apply emotions to tasks, and the ability to manage and regulate emotions. by Richard Florida, The Atlantic Magazine, 7/26/16. 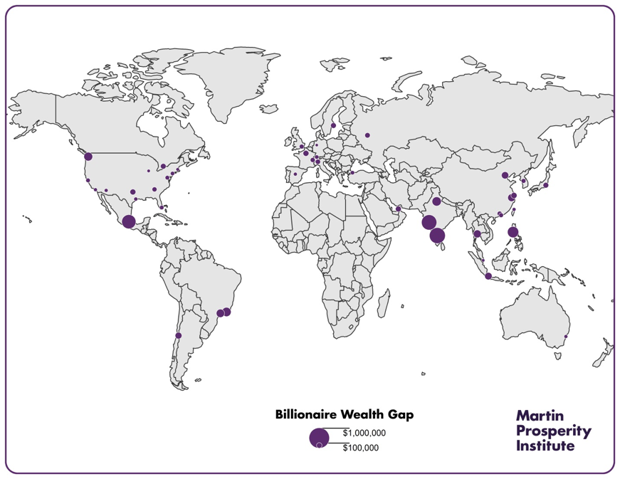 The gap between billionaires and a city’s remaining residents is staggering, according to our measure of the Super Rich Wealth Gap, which compares billionaire wealth to the economic situation of the average person based on economic output per person. This gap is most pronounced in poorer or less-developed cities such as Bangalore, Mumbai, Mexico City, Manila, Jakarta, Delhi, Bangkok, Hangzhou, Beijing, Shanghai, Rio de Janeiro, São Paulo, and Santiago. But it is also quite pronounced in more advanced cities such as Seattle, Dallas, Paris, Stockholm, Toronto, and Tokyo. Commentary by Dr. Whitesel: This is an ongoing series of quotes from the Wesleyan Movement with citations to the original sources. I am pained for you that are ‘rich in this world’. Do you give all you can? You who receive five hundred pounds a year, and spend only two hundred, do you give three hundred back to God? If not, you certainly rob God of that three hundred. You that receive two hundred, and spend but one, do you give God the other hundred? If not, you rob him of just so much. ‘Nay, may I not do what I will with my own?’ Here lies the ground of your mistake. It is not your own. In cannot be, unless you are Lord of heaven and earth. ‘However, I must provide for my children.’ Certainly. but how? By making them rich? Then you will probably make them heathens, as some of you have done already. “What shall I do, then?” Lord, speak to their hearts! Else the preacher speaks in vain. Leave them enough to live on, not in idleness and luxury, but by honest industry. And if you have not children, upon what scriptural or rational principles can you leave a groat behind you more than will bury you? Sermon 131, “The Danger of Increasing Riches”, II. 17. Pew Research, 3/12/15. In general, people in richer nations are less likely than those in poorer nations to say religion plays a very important role in their lives. But Americans are more likely than their counterparts in economically advanced nations to deem religion very important. More than half (54%) of Americans said religion was very important in their lives, much higher than the share of people in Canada (24%), Australia (21%) and Germany (21%), the next three wealthiest economies we surveyed from 2011 through 2013.
by GEORGE GAO, Pew Research, 3/12/15. … Americans’ emphasis on individualism and work ethic stands out in surveys of people around the world. When Pew Research Center surveyed people in 44 countries last spring, 57% of Americans disagreed with the statement “Success in life is pretty much determined by forces outside our control,” a higher percentage than most other nations and far above the global median of 38%.